Our creativity is our greatest gift and we all have it. Let's put aside the IDEA of making art and just tap into our everyday creativity. With creativity, there are no rules. Where there are no rules, there is no fear. So I encourage the act of play in order to create your own style. I call it the "ABC's" of dressing.... Assemble, Build and Construct sculpture upon your anatomical frame. I first met Ari Seth Cohen on October 22, 2009 when he was managing the bookstore at the New Museum. 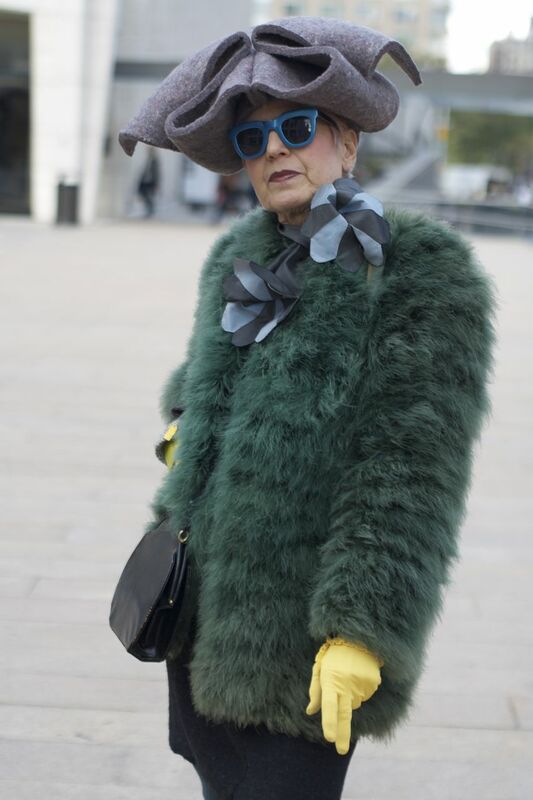 He approached me and asked if he could take my photo for a fashion blog of women over 60! Jokingly I said "How do YOU know I am over 60?" Then he remembered he forgot his camera so he took a 'quickie' with a friends phone. I handed him my card and I said, "Come over...I will dress up, undress and make you a vegetarian lunch!" He was a bit taken aback. So 5 days later I called him and invited him for lunch and that's how it started. He photographed me in a variety of outfits, my artwork, my apartment, me cooking. About two weeks later, Ari introduced me to his dear friend Lina Plioplyte. She is Lithuanian and I am half Lithuanian so the minute she walked in I embraced her and said "I am adopting you! I will be your NY mother!" She would include me on what would later become Advanced Style, the documentary. Through this process, I was able to meet some incredibly fabulous women and found that we all have our own distinct styles and points of view...both in style and in life. For me, it is important to be of sound mind and body in order to thrive. Walking in a city like New York not only acts as a health benefit, it keeps you informed of what is going on in your community and also allows you to interact with others. Talk to everyone and anyone who will engage. It is so fun for me to stay in contact with all the interesting folks I come across. I keep myself stimulated by maintaining my old friendships and also making a strong point to create new friendships with young people, 25-40 year olds, because they are young enough to know what is happening in the world and mature enough to appreciate people in their 70s, 80s, 90s and older. My partner Stan and I love to invite friends of different age groups over for fun and stimulating gatherings. We find that it's a way to keep the community diverse, growing and engaged. Advanced Style and those of us that represent it alongside Ari and Lina are part of a movement. It's about looking good, feeling good and inspiring creativity around us. I love what I do and am proud to be able to play, create and flourish in the rule-free life I've chosen to live. 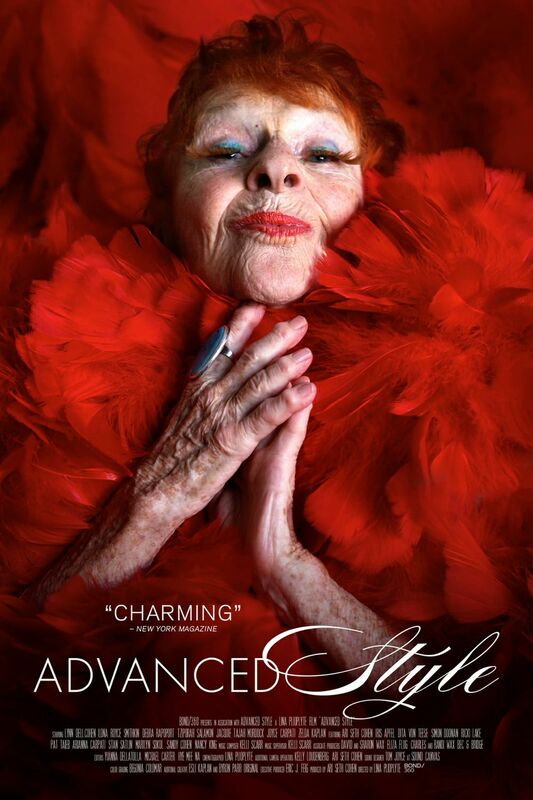 ADVANCED STYLE opens in New York at The Quad Cinema on September 26. For more info on the film and where it is available visit www.advancedstylethemovie.com. While originally manufactured in 1954, today Wayfarers have been experiencing a revival. Groundbreaking in that these shades took advantage of plastic technology, today that are as in style as they were in the 50's and 60's.